The Flatland Digital Artwork Clip Art Gallery: Glowstorm. This one's intense. 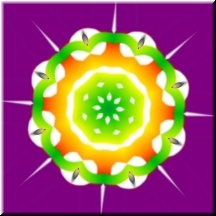 The colors are hot orange, hot lime, yellow, and white on a background of solid purple. It's a sunburst or star or mandala or flower---maybe some psychedelic dandelion fluff---and it really does glow. Maybe it's more seventies than sixties; but I was there (though very young, honestly) and I remember the posters and the pictures. Outasite!